I am a news junkie. I always have a 24 hour news station on in the background, and politics are my jam. 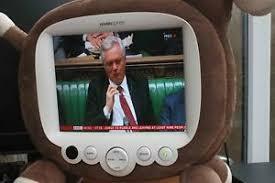 However, when Small and Tiny, my surrogate nieces, are around, I dive for the remote and turn it off. I was thinking about it today, and why I do that, and found that I really couldn't explain it away. I know that they are aware of current affairs, at least as much as a 9 and 12 year old can be, but I still try my best to shelter them from the 24/7 talking heads that I watch whenever I'm at home. It got me thinking about how aware I was of current events when I was a kid, and got me wondering as to what the acceptable thing is to do regarding kids and the news. I come from a news-filled family. I distinctly remember the TV always being on from 5-7 PM at my house, and we watched that little black and white TV in the kitchen at dinner time when the local and then national news was on. I remember big news stories from the 80s and 90s quite distinctly, and even though this was before 24 hour news stations were big, I was always up on current affairs and politics. I can tell you what I was doing for the Challenger explosion, for the '88 Democratic convention, and when the first Gulf War began. I was always aware and informed, and I also read the newspaper (except for the sports section) pretty much every night. All of this got me thinking: was this the normal thing to do? Or in the age of CNN, MSNBC, and FOX, are parents sheltering their kids more from the news? It seems that post 9/11, we have become obsessed with the news, and that could be pretty overwhelming for a child. The noise coming from partisan talking heads yelling about why their side is right and the other talking heads are wrong can be terribly upsetting for an adult much less a child, and the stories that come out of the news seem to be more gruesome every day. However, hiding kids from the world around them is also upsetting, because they will find out anyway, from the internet, playground or teachers of social studies, and wouldn't it be better for them to learn at home, in a controlled environment? It's thought provoking to say the least. For every kid who accompanies their parents to a political rally there is a kid who knows nothing about current events from their parents, and that's the parents' choice, of course. But it certainly got me wondering. So what say you? Hit the comments and let's have a discussion. Are your kids made aware of current events at home? Do you watch the news as a family? And what is that like?